Feel the Fear and do it anyway – that’s what they say! The premise is simple, when we understand that fear is omnipresent and it is more prevalent on unfamiliar ground, then we could decide to jump in the deep end – to feel the fear and do it anyway. We hope through exposure we can experience less fear the next time, on what now will feel more like familiar ground. If you are not embracing fear on a daily basis, well then you simply are not stretching, growing or challenging yourself. HOWEVER….. Think of public speaking, the most commonly shared fear on the planet. You poll any major city on the planet, polling “what are we afraid of the most?” – the resounding majority of answers are: a fear of public speaking or what is commonly known as performance anxiety. To tackle this fear over the last century or so, many approaches, philosophies and organisations have been developed, a commonly known one is called Toastmasters. At toastmasters you can be expected to jump in with both feet, without a life preserver, straight into the deep end. “Feel the Fear and do it anyway” they proclaim loudly. We are all born with the innate talent and knowledge to swim, it’s part of our evolutionary genetic blueprint. If you take a new born and playful place them in a swimming pool they will float, swim and enjoy the experience. We are born understanding that we can swim, that we will cope just fine, we inherently trust the water. If then over time we are expected to perfect our swimming technique or we have a traumatic experience in a swimming pool or we have a parent who has a fear of swimming, well we can learn to fear the water. 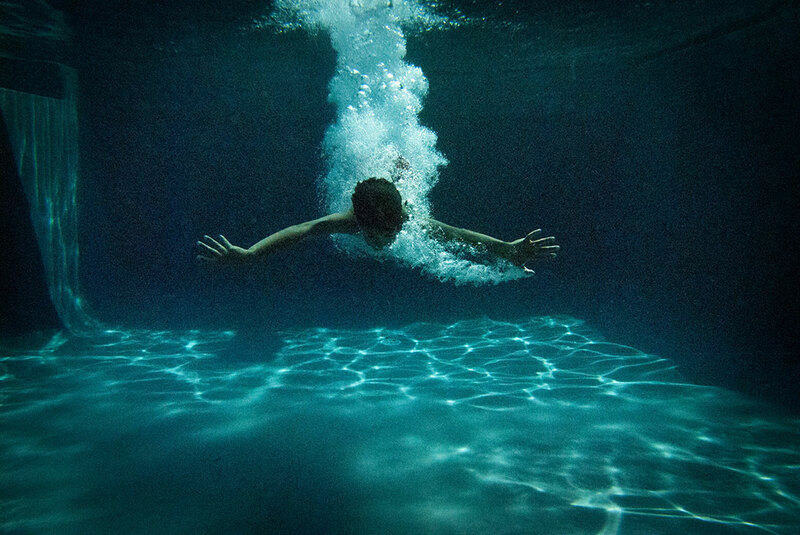 We forget we are natural born swimmers, that we float and we start to believe that we cannot float and we won’t cope. So we probably avoid swimming, we avoid the water, we believe we cannot cope. If you encountered someone with a fear of swimming, who now feels motivated to relearn to swim. Someone who now feels fearful apprehension at the thought of swimming. Where would you start with them? Would you push them straight into the deep end or would you start them off in the shallow end? Like water in a swimming pool, general fear is omnipresent – it is all around us. We don’t want to jump into the swimming pool because we don’t think we can float in the water, like the way we don’t think we can cope with the feelings – we might sink. Toastmasters is fine for someone who already understands they can float, someone who understands they will cope with the feelings. Toastmasters focus on the content and performance in the same way a swimming instructor drills swimming technique. It can assist progress with people who can already swim. However, if you don’t know you will get through the process, if you fear that you will sink, if you have been avoiding the water, then jumping in the deep end means that you are setting yourself up to fail. No wonder people sink to the bottom, only left with more evidence that it is true, they are not good enough for this. I remember a story a client once told me, he had attended a number of toastmasters events during the summer, he thought “I want to tackle this now, I’m ready!” He went along and every-time dreaded his time, to stand and give a speech, he wasn’t sure what he disliked more, was it the formal setup, was it the expectancy that he would improve week in week out or was it the feedback following his inevitable shaky performance. His continued lack of understanding and these repeated experiences managed only to compound the feeling of fear, almost like trying to get over a fear of water by running head long into the deep end of swimming pool. The final straw came for my client, after 6 evenings of this he really started to notice that the returning people in the room didn’t seem to improve, the already competent speakers, the ones who already understood they could swim did really well. However, the handful of people who reported things like “Ive been attending these evening for 15 months now, on and off” the ones who had been attended over the longest period, well they showed no improvement and sank evening after evening after evening. Appearing to only reconfirm and compound their fear. No wonder – communication ability and connection to others, like swimming ability and floating in water, are innate attributes we are all born with. We have evolved to connect with the outside world and develop communication skills. This is part of our evolutionary genetic blueprint. We all have different and unique approaches to this, and that too is fine if not natural. The water in the swimming pool is like the feelings in our body when speaking to a group, we have lost our understanding of them because we have been avoiding them for so long, we now think these feelings are dangerous. However like learning to trust water again in the shallow end we must learn to trust our feelings again. So we get in, we take all the pressure off ourselves to be good swimmers, let alone be the perfect swimmer. We understand that this is not about swimming anyway, that it’s about changing our relationship with the water. How do we change someone’s relationship with an emotion or feeling that they have been avoiding for a long time or to a situation they perceive to be dangerous. How do we show someone that the water is safe, that they can float and swim and even enjoy doing so. Once we learn that we can be in it, feeling the water all around and understand that we can float well that is when we can start improving some skills. Maybe even start learning different swimming styles, learning the best breathing techniques, developing good pacing and a flexible approach to development – that’s when we can start to enjoy swimming again. Through the correct approach to exposure, the feelings become extinct, the heightened emotional arousal will change into something that we can harness. Then who knows once we have this trust in the water and in ourselves. What depths could we reach in the future and what fun we will have just splashing about in the water. See our Anxiety Hypnotherapy London page.